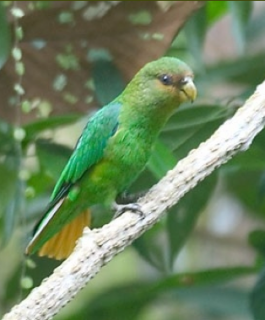 Parrotlets are the smallest of the New World (South American) parrot species. Likely 60-70g, as in other Touit sp. T.s. surdus: Male-thin frontal band and face gold/yellow; hindneck tinged olive; scapulars and upper tertiary feathers olive/brown; dull blue marking on carpal edge; flanks and sides of lower breast green/yellow; underwing coverts green; centre tail feathers green tipped with black, the side tail feathers green/yellow tipped with black. Bill olive/yellow with grey at base. Eye grey. Female-side tail feathers green/yellow margined and tipped with dull green. T.s. ruficauda: Both adults side tail feathers brown/yellow; smaller in size. Fairly loud and reminiscent of a flock of seagulls. Threatened by loss of forest habitat, urbanisation and agriculture expansion. T.s. surdus: SE Brazil, from southern Bahia and possibly southern Goias, south to Sao Paulo. T.s. ruficauda: NE Brazil in Paraiba, Pernambuco and Alagoas. Lives in humid lowland forest but occasionally visits lower montane slopes, secondary forest canopy in otherwise open country, also will visit fruiting trees in cleared areas. Up to 800m (2624 ft). Eats fruits of Sondius lutea and Rapanea schwackeana. May be seasonally locally nomadic in response to food availabliity. Seen in pairs or small flocks of up to 15 birds. Stays in upper canopy of forest. Probably at the start of the rainy season, September-October.